Brand new research shows a link between journalism education and voting. Read more here. 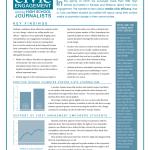 In the spring of 2015 we surveyed more than 900 high school journalists in Kansas and Missouri about their civic engagement. We wanted to learn about media-civic efficacy, that is, about how confident student journalists felt about using their school media to promote change in their communities. Media-civic efficacy flourishes in supportive school environments. The entire school, not just the journalism teacher, fosters a community in which student journalists feel they can use their media to address important issues. Supporting free expression goes hand-in-hand with media-civic efficacy. Students who endorse a greater number of First Amendment free expression rights are more confident that they can express themselves through the media to promote social change. Teachers who exert less control over the content their students publish advise more civically confident students. While most of these teachers reported reading content before it was published, they tended not to prohibit or worry about their students tackling controversial topics in the student media. Students with more journalistic experience, in terms of years in a program and contributing to a news publication, expressed greater confidence in using the media for civic action. Click here for a two-page summary of the study’s findings in PDF.